Yalllllll. Lindsey is friekin amazing so you need to read my rant. When I first read Lindsey’s initial email, I literally laughed out loud as everything she said aligned with some aspect of what gets me excited to photograph someone. 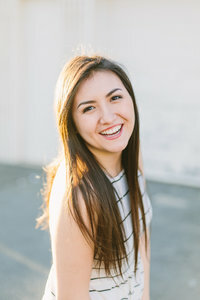 In it she wrote how she was laid back, loved natural lighting (sunset being her favorite ever – same girl same), dressed boho and wanted to emphasize that, and that she didn’t want the typical cap and gown pictures. She even used a lot of smiley faces and exclamation marks like me!! Gold. I don’t usually have time to meet up with clients beforehand due to busyness and time constraints (although I so would with every client if I could!! ), but Linds and I ended up having the time to go on a coffee date before shooting…and boyyy did my excitement for this session shoot up x10 after. You know that feeling of 100% comfortableness and perfectly matched energy you can sometimes get when you first meet someone? That was what is was like meeting Lindsey. Linds is so smiley, welcoming to everything you say, interested in getting to know you and your story, and emits such a positive, contagious energy. I so wish I got to know her sooner because I could’ve honestly seen us becoming suchhh good friends in the beginning of the year, but it’s okay because our friendship can start now! See, that’s the one downside about shooting with seniors… right after you meet them and hit it off, everyone moves away for college or grad school. But it’s okay, then you just have 10x more friends in 10x more states across the nation. Since Lindsey didn’t want the typical JMU Senior Quad shoot, we decided to drive 30 minutes outside of Harrisonburg to this beautiful place my friend and I happened upon a few months ago. It was the perfect location for our boho/natural/flowy theme. Also, can I shout out Lindsey’s style real fast? Like Linds will you take me shopping?!?! All of her details from rings to skirts were a dream to capture. Words can’t express the high feels during this shoot. Let’s just say that after we departed tears were shed. Yeah it might sound weird to some, but I wouldn’t trade any job or amount of money for a job that’s as life-giving as this one. A job that allows you spend only 2-3 hours with someone who starts out as a client but ends as a friend. A job that can make any given shoot one of the coolest experiences. I can’t wait to sacrifice a bit of my finals study time for another coffee date with Linds! Hopefully we can get together in Phoenix next year after she moves there THIS SUMMER to pursue her doctorate in occupational therapy at Northern Arizona University!! Lindsey made this cute sign to use in her grad school announcement posts on social media!! We actually coordinated the day and time she was going to announce with this blog post, so whether or not you personally know Lindsey and are reading this, everyone is finding out at the same time!! So exciting. Read the blurb I wrote in the beginning to learn where she’s going exactly and what she’ll be doing there!! This outfit before…this location. Alrighhtyy. Is this not the cutest picture of Linds below or what?! I’m obsessed. Also, that ring. The best clients are the ones that are willing to do whatever to get the shot. And Lindsey was so down to go in the water for that. youuuu + Lindsey + Her outfits + your style <3 such a magical shoot. I am SO stinking proud of you. these take my breath away!! !